The Barn is represented at the European Film Market. Schedule a meeting here with ITN Distribution Inc at the Ritz-Carlton Hotel, Suite #506. The Barn signs with ITN for International sales. 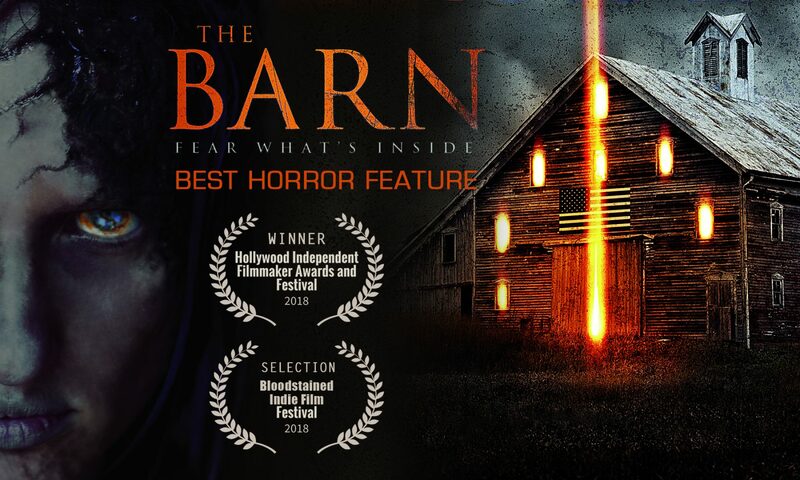 The Barn won bronze as Best Horror Feature at the Hollywood Independent Filmmaker Awards. Screening took place at Paramount Pictures studios. The Barn is released in the US & Canada by Gravitas Ventures. The Barn listed #1, iTunes pre-order; for all September 4th, 2018 releases. The Barn will be released on September 4th, 2018. The movie is available for pre order on ITunes now. “Broken Doll”, the soundtrack song of The Barn, just won 4 awards at the COFF. The song brings up a powerful message that echoes many people and life situations, resonating with electro beats and a powerful sound production. Score and soundtrack soon available. The first trailer is available for distribution purposes. Distributor Gravitas Ventures acquires THE BARN for distribution and sales in North America (USA and Canada), all medias except theatrical. Sound mixing in Culver City (Los Angeles) and color grade in New York. Part of the post-production of THE BARN goes back to Sante Fe, New Mexico. Composer Auregan records the score of the feature. Director and executive producer Matt Beurois was again at the American Film Market to meet distributors for the international sales of The Barn. New poster revealed starring French A-List actor Yannik Mazzilli as Earl Perry. Production company Yucca Prime is attending the AFM American Film Market to promote THE BARN and pitch new feature films. Producer Auregan and director Matt Beurois attend the PGA -Producers Guild of America- event on Hollywood at the American Legion Post 43, to promote THE BARN. The teaser trailer of THE BARN is released. The first poster of the film is published online. The film goes into post-production into a Santa Fe studio facility, in New Mexico. By mid-october, the new draft of the film is 78 minutes at the moment. The second draft is completed. The film is 2 hours long at this moment. POST PRODUCTION. The first draft of the film is put together by 1st assistant editor Arnaud Devineau, by the end of July. The second draft of the film, including foleys and opening credits is completed by the director by the end of August 2017. Composer and singer-songwriter Auregan records the official end-credits sondtrack song at the A.M.D studio in France. Most of the cast and crew of THE BARN meet again at the Paris Art and Movie Awards film festival, on the Champs Elysées.